Object of study. Planned distribution establishment of erosive “spots” of the agricultural lands is based on the processing of binary images of aerial photographic materials using morphological and planimetric methods of analysis. Methodology. Offered methodology is based on the non-linear operators’ application. These operators are mathematically described by the theoretical and set formalism. Mathematical morphology uses two main morphological filters which can be represented as a successive combination of two stages of image analysis on the basis of the morphological operators using: constriction and extending. Results. For obtaining maximal image characteristics it was suggested to carry out processing in the following sequence: binarization, segmentation, and morphological and planimetric definitions. Binarization content is characterized by bright spots, which show the release of soil-forming rocks to the surface, which can be divided by well-known method of prof. V. M. Sokolova (with sequential split pixels). The above-mentioned process is mostly used in digital photogrammetry. The corresponding mathematical apparatus is represented. The next stage of binary image processing is the allocation of adjacent boundaries and sites by the Laplace’s method of segmentation. In such a case, an estimation of two different contrast areas A and B is conducted. To determine the boundaries of their division, the marks of the contrast ratio’s second derivative are estimated. It is offered to carry out segmentation according to graph theory. An illustration of this segmentation is represented graphically. At the third stage of the study, morphological and planimetric determinations were performed on the investigated image using 2 × 2 pixel masks. As a result, it is possible to calculate statistical distributions of spots on aerial photographs by area, perimeter, and factor form. Scientific novelty. The offered method of step-by-step processing of aerial photography is based on the use of binary and segmentation methods which allow acquiring a precise image and more accurate results of morphological and planimetric definitions. Practical significance. According to the above-mentioned algorithm, some morphometric characteristics of spots on aerial photographs were analyzed: area, perimeter, and form factor. Application examples which confirm the universality of the suggested method for analyzing images in a microphotogrammetry are given in the work [Melnyk, 2013]. 1. Dorozhyns'kyj O. L., Tukaj R. Fotogrammetrija [Photogrammetry]. Lviv: Vydavnyctvo Nacional'nogo universytetu "L'vivs'ka politehnika" [Lviv Polytechnic Publishing House]. 2008, 332 p.
2. Fowlkes C., Martin D., Malik J. Learning Affinity Functions for Image Segmentation: Combining Patch-based and Gradient-based Approaches. 2003. 3. Kendall M., Moran P. Geometricheskie verojatnosti [Geometric Probabilities]. Moscow: Nauka [Science], 1972, 192 p.
4. Kiberneticheskij sbornik. Novaja serija, issue. 27. Sb. statej: Per. s angl [Cybernetic collection. New series. 27. Sat. articles: Per. with English]. Moscow: Mir. 1990, 200 p.
5. Marchukov V. S. Teorija i metody tematicheskoj obrabotki ajerokosmicheskih izobrazhenij na osnove mnogourovnevoj segmentacii [Theory and methods of thematic processing of aerospace images based on multilevel segmentation]. Avtoreferat dissertacii na soiskanie uchenoj stepeni doktora tehnicheskih nauk 25.00.34. Ajerokosmicheskie issledovanija zemli, fotogrammetrija [The dissertation author's abstract on the competition of a scientific degree of Doctor of Technical Sciences 25.00.34. Arospace studies of the earth, photogrammetric]. Moscow, MIIGAiK, 2011. 6. Melnyk V. M., Mendel V. P. Geometrychne doslidzhennja erozijnyh procesiv metodom trypletnoi' kvazikonvergentnoi' fototopografii [Geometrical study of erosive processes using the triplet quasiconvergent phototography technique]. Naukovyj visnyk Volyns'kogo nacional'nogo universytetu imeni Lesi Ukrai'nky [Scientific Bulletin of the Volyn National University named after Lesya Ukrainka]. 2012, no. 18(243), pp. 179–186. 7. Melnyk V., Radzij V., Mendel V. Dejaki pytannja identyfikacii' modelej vodnoi' ta vitrovoi' erozii' [Some issues of identification of water and wind erosion models]. Suchasni dosjagnennja geodezychnoi' nauky ta vyrobnyctva [Modern achievements of geodesic science and production]. 2013, no. I (25), pp. 139–144. 8. Melnyk V. M., Shostak A. V. Rastrovo-elektronna stereomikrofraktografija: monografija [Raster-electronic stereomicrofractography: monograph]. Luc'k: red.-vyd. vid. VNU im. Lesi Ukrai'nky [Lutsk: ed. from. VNU named after Lesia Ukrainka]. 2009, 468 p.
9. Molchanova V. S. Adaptivnyj porogovyj metod binarizacii rastrovyh izobrazhenij tehnicheskih chertezhej [Adaptive threshold method of binarization of raster images of technical drawings]. Radіoelektronіka, іnformatika, upravlіnnja [Radiation Electronics, Informatics, Management]. 2015, no. 2, pp. 62–70. 10. Navon E., Miller O., Averbuch A. Color image segmentation based on adaptive local thresholds. Image and Vision Computing. 2012, no. 23, pp. 69–85. 12. Protsyk M. T. Metodi fotogrammetrichnogo ta kartografіchnogo suprovodu bagatorіvnevoї sistemi monіtoringu erozіjnih gruntovih procesіv: avtoref. disertacії kand. tehn. nauk [Methods of photogrammetric and cartographic support of a multilevel monitoring system for erosive soil processes: author's abstract. Theses Cand. tech Sciences]. Lviv, 2012, 26 p.
13. Rozenfeld A. Raspoznavanie obrazov i obrabotka izobrazhenij [Image recognition and image processing]. Moscow: Mir, 1972, 230 p.
14. Salnikov I. I. Metody raspoznavanija slozhnyh binarnyh izobrazhenij na osnove postrochnogo i sledjashhego analiza [Methods for recognizing complex binary images based on line and trace analysis]. «Iskusstvennyj intellekt» [«Artificial Intelligence»]. 2013, no. 3, pp. 242–252. 15. Sauvola J., Pietikainen M. Adaptive Document Binarization. Pattern Recognition. 2000, no. 33, pp. 225–236. 16. Sergeev V., Sokolov V. Quantitative morphological analysis in a SEM-microcomputer system. J. Quantitative shape analysis of sing fie objects. Journal of microscopy, 1984, V.135, Pt.1, pp. 1–12. 17. Serra J. Image Analysis and Mathematical Morphology. London: Academic Press. 1992, pp. 329–341. 18. Shostak A. V. Assessment of dispersed soils and their main rheological properties. Urban planning and territorial planning. Kyiv, 2011, issue 39, pp. 465–475. 19. Sokolov V. N., Jurkovec D. I., Rozgulina O. V., Melnik V. N. Avtomatizirovannaja sistema morfologicheskogo analiza skeletnogo komponenta mikrostruktury po RJeM-izobrazhenijam [Automated system of morphological analysis of the skeletal component of the microstructure according to SEM images]. Poverhnost'. Rentgen., sinhron. i nejtron, issled [Surface. X-ray., Synchronous. and the neutron, Issled]. 2002, no. 10, pp. 66–69. 20. Sokolov V. N., Jurkovec D. I., Rozgulina O. V., Melnik V. N. Metod kolichestvennogo analiza mikrostruktury tverdyh tel po RJeM izobrazhenijam [The method of quantitative analysis of the microstructure of solids by SEM images]. Zav. lab. [Head. Lab. ], 1997, no. 9, T.63, pp. 5–35. 21. Tumska O. V., Protsyk M. T., Yanchak V. Ya. Doslidzhennja avtomatychnoi' pobudovy cyfrovoi' modeli rel'jefu VLL-metodom za materialamy aerofotoznimannja [Investigation of the automatic construction of the digital model of relief by VLL-method based on aerial photography]. 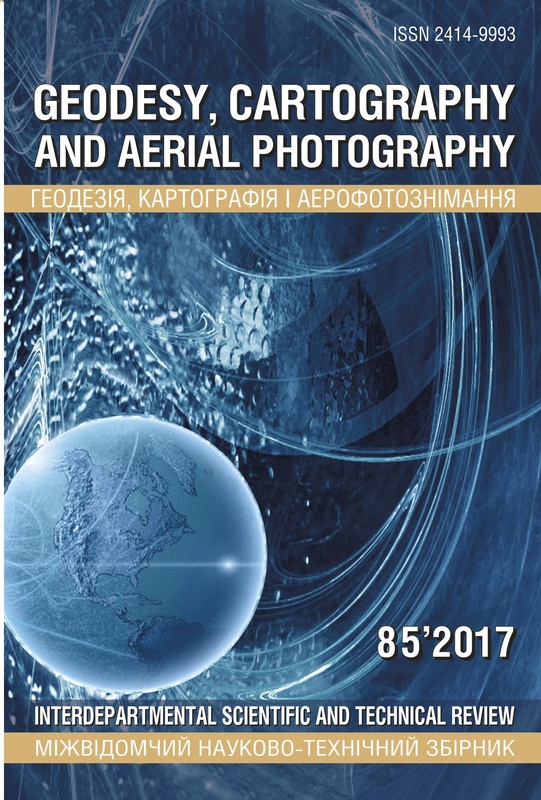 Geodezija, kartografija i aerofotoznimannja [Geodesy, cartography and aerial photography]. Lviv, 2004, no..65, pp. 96–104. 22. Vizil'ter Ju. V. Teorija i metody morfologicheskogo analiza izobrazhenij [Theory and methods of morphological images analysis]. Avtoref. diss. dokt. fiz.-mat. nauk [Author's abstract. diss. Doct. fiz.-mat. sciences]. Samara, 2009, 32 p.
23. Yang Y., Yan H. An adaptive logical method for binarization of degraded document images. Pattern Recognition. 2010, Vol. 33, pp. 787–807. 24. Zamjatin A. V., Markov N. G. Analiz dinamiki zemnoj poverhnosti po dannym distancionnogo zondirovanija Zemli [Analysis of the Earth's surface dynamics from remote sensing data of the Earth]. Moscow: FIZMATLIT. 2007, 176 p.
25. Zhang Y. Highlight Article: Understanding Image Fusion. Photogrammetric Engineering & Remote Sensing. 2004, Vol. 70, pp. 657–661.